The Glass Ceiling Index: Where are the best & worst places to be a working woman? According to The Economist’s 2018 glass-ceiling index, a yearly assessment of where women have the best and worst chances of equal treatment at work in countries in the Organisation for Economic Co-operation and Development (OECD), Australia is ranked 16, just ahead of the OECD average which sits at around 18. This index, the sixth compiled by The Economist’s data team, shows the disparity between countries in terms of workplace gender equality remains wide but women have made some progress towards equity in the workplace in the past year. The overall share of women in the labour force, with a tertiary education and those taking business-school entrance exams, which is a pipeline for senior executive jobs, grew. Each country’s score is calculated by its average performance across ten indicators that include educational attainment, labour-market attachment, pay, child-care costs, maternity and paternity rights, business-school applications and representation in senior jobs. Sweden took over from Iceland as the best place to be a working woman this year, while Britain fell from 22nd to 25th place with fewer women attaining higher education. America rose from 20th to 19th place thanks, in part, to a higher female labour-force participation rate, and more adult women with tertiary degrees. The average percentage of women on boards across the OECD is still quite low at 21.8%, up by just 1.3% from last year. 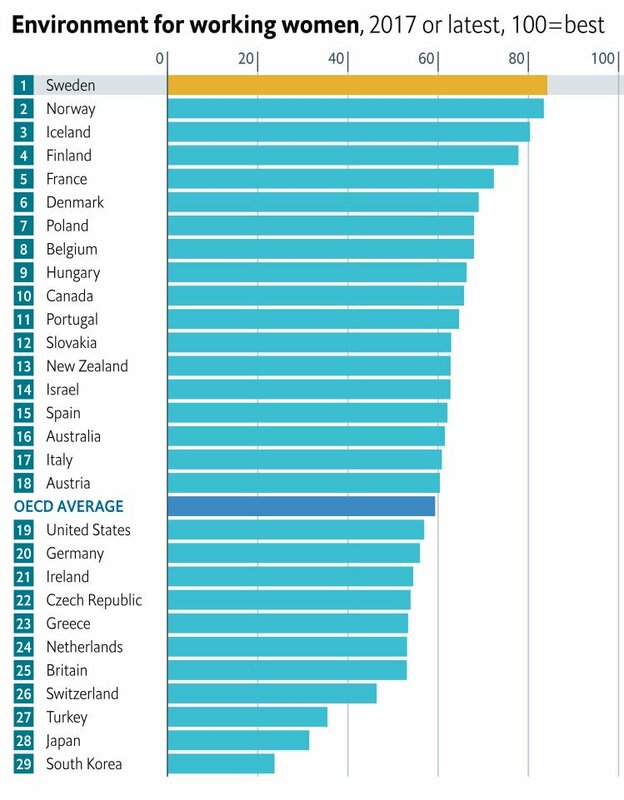 Turkey, Japan and South Korea lag their OECD peers considerably and take out the bottom three positions. In Australia women’s tertiary education attainment is 7.9 points higher than men’s, while the workforce participation rate of women is 10.7 points lower than men. on average compared to men who get the equivalent of .8 weeks paid paternity leave. The GCI was launched in 2013 with five indicators and 26 countries, compared to ten indicators and 29 countries now. Previous ArticleIs the PM's intervention & the 'bonk ban' the start of #MPToo?